Oak Tower, also called the Bell Telephone Building, is a 28-story skyscraper in Downtown Kansas City, Missouri. Hoit, Price & Barnes, a local firm that conceived many of Kansas City's landmark structures, designed the building in association with I.R. Timlin as the headquarters of the Bell Telephone Co.'s newly consolidated Southwestern System. Ground was broken at Eleventh and Oak Streets in 1917, but due to shortages of manpower and materials during the First World War, construction was delayed and was not completed until 1920. 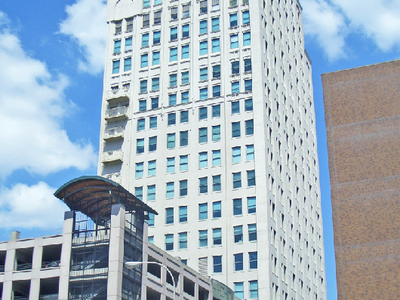 The new building served as Southwestern Bell's general headquarters for only a year before the company moved its main office to St. Louis. Thereafter the tower served as the headquarters of Southwestern Bell's operations in Missouri. The tower was originally 14 stories (185 feet), without any set-backs, but the fast-growing telephone company soon required more space. An addition completed in 1929 doubled the tower's height and made it the tallest building in Missouri until the Kansas City Power & Light Building surpassed it in 1931. Here's the our members favorite photos of "Skyscrapers in Kansas City". Upload your photo of Oak Tower!